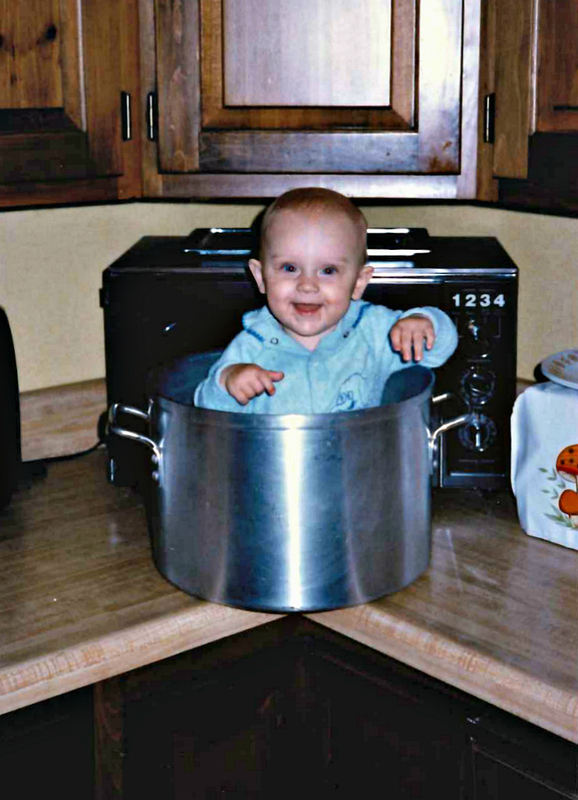 there's yours truly as a toddler in a stock pot on the kitchen counter. totally normal. (who needs a bumbo when you have a stock pot, right?) today's my birthday and somehow i'm now 31. this photo seems like it was taken a lifetime ago. it blows my mind to think it's over three decades old. for fun today, i thought i'd share 31 random things about me. ready? here goes . . .
2. as soon as i was old enough to sit up on my own, my mom sat me on the kitchen counter and taught me how to cook, so being in the kitchen is second nature to me. 3. i learned math by helping my mom in the kitchen and at the grocery store. recipes are a great way to teach kids about fractions and coupons/discounts are a great way to learn percentages. 4. i am really good at mental math. i'm always the one at the store calculating discounts and coupons in my head (and i'm usually spot on)! 5. i have never lived in a state other than pennsylvania. 6. if i had to choose another state to live in other than pennsylvania, it would be california (even though i have never been there). 7. i have never owned a dog, and i have no desire to (mainly because i would not want to walk a dog every day). i'm a cat person all the way. 8. my family calls me the cat whisperer because i absolutely love cats and they seem to gravitate to me. i find them all the time when we are out walking or biking. 9. my dream job would be to own a place where i could care for cats and keep them safe until they are adopted. 12. my favorite place i have ever traveled was hawaii in 2013. it was a dream come true to travel there, and to date it was the best vacation i have ever taken. 13. i have not consumed any caffeine in over 11 years and i am one of the most alert people i know (proving that you don't need a cup of coffee to be wide awake). 14. my drink of choice is water with lemon. it's my absolute favorite thing to drink. 15. i love organizing things. 18. i'm not a reader. i love reading magazines/blogs, but i hate reading books. i'm much more of a visual person instead of a reader. 19. i learned how to write from my dad and i pride myself in having proper grammar because of him. 21. as a child, i never had an imaginary friend. the concept always seemed odd to me. 23. dancing is in my blood because my mom danced up until she was 8 months pregnant with me. 24. i had a dance minor in college and i have been trained in every single type of dance (yes, even flamenco) but my absolute favorite is classical ballet/pointe. 26. ryan and i are exactly 4 months and 23 days apart in age (he's older). coincidentally, 4 and 23 are my two lucky numbers. 27. i don't have any tattoos, but if i ever got a tattoo i know exactly what i would get - the word "love" very small, written in all lowercase script letters in my brother's handwriting, on the inside of my wrist. i have been sure of this for about 10 years, but i have never been able to commit to a tattoo. 28. i don't have an accent. i was taught to be non-dialectical when i majored in theatre in college. 29. my favorite colors are orange and purple. 30. i consider myself to be very spiritual, but not religious. 31. i have been cutting ryan's hair for as long as we have been together. he has not had his hair cut by anyone but me in 11 years. i estimate that we have saved approximately $3,500 to $4,000 over the past 11 years by doing this! Love that Picture. To me it seems like yesterday. How did you get to be 31. I like all your 31 items. Let's start a cat shelter.